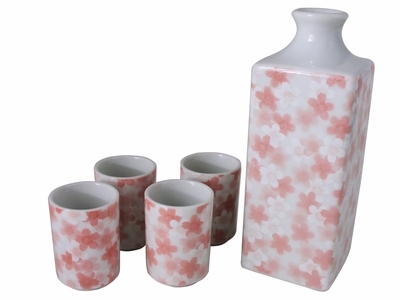 Made in Japan and crafted from quality ceramic, this cherry blossoms Japanese sake set for four is part of the Light of Spring collection, and features the well loved Japanese cherry blossoms as this set’s central motif. Cherry blossoms, also known as sakura, is a well loved flower in Japan. Blooming in spring, cherry blossoms are celebrated for their gorgeous but short bloom. A poetic symbol of transient beauty, cherry blossom is commonly featured in Japanese art and poetry. Beautifully glazed to a smooth polished finish, this cherry blossom Japanese sake set features a sake jug and four matching sake cups. Perfect for serving and enjoying your favorite sake warmed or chilled in the company of friends. Beautiful impressionistic depictions of cherry blossoms in bloom in gently arranged to give the impression of cherry blossom flowers waving gently in the breeze. Dishwasher safe, this cherry blossom Japanese sake set makes an excellent gift idea for friends and loved ones. The set is absolutely charming! The cherry blossoms are delicate and such a lovely color. The set is delicate in appearance but will be substantial for use. I am very pleased with my purchase and looking forward to presenting it as a gift.